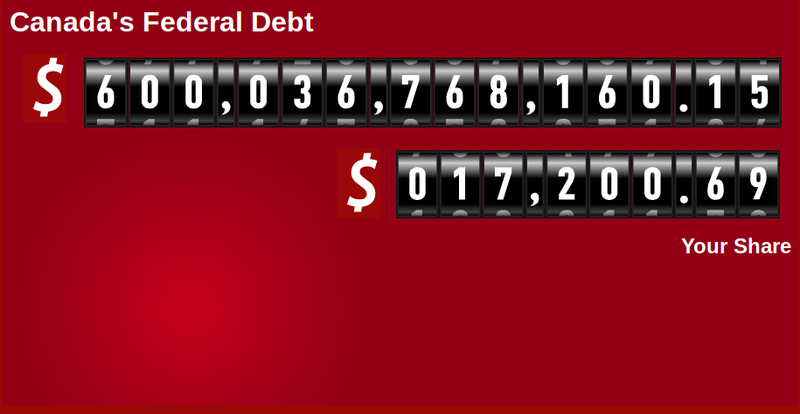 “Canada’s federal debt is growing at a rate of $1,024 per second. That’s $61,454 per minute and $3.7-million per hour. This level of borrowing is costing Canadians not just the principal, but interest each year. In fact, the federal government spends $31.5 billion per year just paying the annual interest on the debt. This entry was posted in Finance and Economics, Picture of the Week and tagged $58 million a day, 600 billion, balanced budget, clock, debt, Federal, government, STOP campaign by cnlib. Bookmark the permalink.